JOIN US in Spring 2020! If you are interested in coming on our tour you can email us at info@cwebb.ca Our tours fill quickly so make sure that you book your place soon on our 2020 trip to bell'Italia! Christopher Webb & Victoria Foulger have been leading tours to Italy since 2009. Italian-Canadian artist Christopher Webb and PAVIA Gallery ~ Espresso Bar & Cafe award winning CEO Victoria Foulger (see LinkedIn Profile - Here) lead the group through the eternal city of Roma and then set off to some of Italy’s most picturesque areas of Umbria & Tuscany. This unique tour will allow you to experience some of central Italy’s less travelled but monumentally gorgeous cities, towns and villages. Experience these magical lands from a passionate perspective. Amazing landscapes and locales. Unique dining. Even with our busy schedule there will be opportunities to wander off and enjoy a bit of time on your own. This exclusive tour, as always, will be limited to a maximum of 16 participants. Meet the group and join us for a welcome glass(es) of procescco on the roof-top patio while taking in the stunning views of Roma. SATURDAY, APRIL 25th, 2020: Whether you are arriving from Europe or an overnight flight from North America (or any other part of the world) let us be the first to say Benvenuto! After touching down in Rome (or arriving at Termini Train Station), you will make your way to our beautiful and historic hotel located in downtown Rome. Get yourself settled, explore the area, or just sit in the quiet of the hotel’s large courtyard garden. In the evening we all get together to meet, share a glass of wine, and talk about our adventures to come. The Pantheon: One of the best preserved buildings in Rome which dates back nearly 200 years. SUNDAY, APRIL 26th: How do you take in a city like Rome in just one day? Well, just follow Christopher & Victoria and you will cover more than 2000 years of history with a few coffee and gelato stops along the way. Trastevere will be our starting point, then across the oldest remaining foot-bridge in Rome, across the Tiber, through the Campo di Fiori, up the main street to the monument to Vittorio Emmanuelle II. To the left is Trajan’s Column and the Triano district. Straight ahead to the right is the Roman Forum (where, in fact all roads officially lead!) Then we breeze by the Arch of Constantine and the Colosseum. Take a breath, because this is all before lunch! After continuing into the centre of Rome and seeing sights like the Pantheon and Trevi Fountain our late afternoon turns into evening. We meet for dinner and replenish calories. This is our busiest touring day of the trip. Rome wasn’t built in a day, but we cover as much as we can within that time frame! Tarquinia is often overlooked as a tourist destination but is a beautiful and is one of Italy’s most historically significant places! MONDAY, APRIL 27th: After a leisurely breakfast our driver picks us up at our hotel and we take a quick drive to one of our favourite towns, Tarquinia - possibly one of Italy’s most important Etruscan cities. We take a walking tour, visiting the famous Etruscan tombs and then, as we stroll down the hill, we meet one of town’s most important artists and stop for a quick lunch. In the early afternoon we drive directly to our Villa tucked away in the Tuscan landscape just south of Florence. Once you are settled we will have a welcome glass of something local and then we sit down to a beautiful, locally inspired meal. Lucca is a town full of charm and surprises, including the Piazza dell'Anfiteatro. The buildings surrounding the square are in the circular shape of the former second century Roman Amphitheater. TUESDAY, APRIL 28th: Today we make our way to Lucca, a must-see town just West of Firenze. This city is famous for its Renaissance-era city walls that have remained intact while so many other Tuscan towns saw theirs destroyed in past centuries. Extraordinarily, as the city grew and modernized, the walls that surrounded the old town were maintained and today are used as a pedestrian promenade – perfect for a stroll or cycling. There is lots to see within a relatively small area so it is easy to take in all of the sites. Puccini anyone? If you want, you are welcome to climb up through the tight squeeze of the double-helix passage way in the Duomo of the Cattedrale di Santa Maria del Fiore. Or you can just shop. That’s okay, too. WEDNESDAY, APRIL 29th: We get to Florence early to enjoy the morning light for our visit to the Boboli Gardens. Located directly behind Pitti Palace the Medici family established the layout of the gardens, which is essentially an outdoor museum populated by ancient and Renaissance statues. After our visit we cross the Ponte Vecchia and do a quick walking tour of the downtown core: the Piazza della Signoria, Loggia dei Lanzi, Cattedrale di Santa Maria del Fiore and its bell tower. The second of our “tower towns” San Gimignano is one of the most famous small towns in all of Italy. THURSDAY, APRIL 30th: This morning we take our time to leave the Villa but when we do we venture to the famed small town of San Gimignano. This walled, medieval hill-top town is known for its medieval architecture, unique in the preservation of about a dozen of its tower houses. We will have time for a little lunch and wander around. In the mid-afternoon we regroup at our Villa before heading out to dinner. Although it is not one of our included meals, this evening we have a reservation in one of the most wonderful restaurants in all of Italy. This generationally, tiny, family run spot is tucked away in the hills of the Chianti region. Enter the magical world of one of Europe’s most influential families: the Medici. FRIDAY, MAY 1st: Although we are reluctantly saying arrivederci to our first Villa, there is so much more ahead. We make the short drive to our final stop in Tuscany. Nestled in the hills of Chianti this beautiful Villa was once owned by the famed Medici family. The wine estate epitomizes the Tuscan lifestyle and casual sophistication with tranquil terraced gardens surrounded by 70 hectares of vineyards and olive groves. We enjoy tasting a number of their wines along with a light lunch. Assisi at sunset: this is one of the world’s great pilgrim destinations and the birthplace of Santa Chiara and San Francisco. SATURDAY, MAY 2nd: It has been a destination for pilgrims around the world. Assisi is best known as the birthplace of St. Francis of Assisi — patron saint of Italy and founder of the Franciscan order. 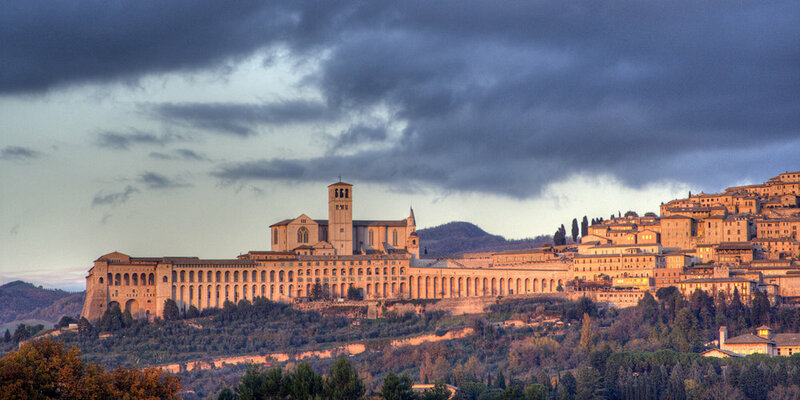 Assisi's main attraction is the 13th-century Basilica di San Francesco, which contains the sacred relics of Francis and beautiful frescoes of his life which are attributed to the Renaissance master Giotto. We then take a small detour to one of the less visited sites of Assisi: The Basilica of Santa Maria degli Angeli, which includes the Porziuncola, the most sacred place of the Franciscan Order. St. Francis of Assisi died here and the small, original church looks tiny in the middle of this gigantic place of worship! The view from the main dining area at our villa in Umbria. SUNDAY, MAY 3rd: Every tour we take we try to make it better. One of the things we hear every time is, “Can we please have a whole day at the Villa in Umbria.” Yes. Yes we can. Todi is a gem in the Umbrian landscape. MONDAY, MAY 4th: Today we head to a beautiful place very close to our villa. We take the fanicula to the top of the town of Todi where the views are spectacular. Along with the historic sites, there are so many little shops to explore. It is a great example of what real life in Italy is all about. Stroll the streets or visit the Cathedral or civic museum. Continuing our day we drive the short distance and take the road less travelled to an organic olive oil farm and visit their 'Museo Dell'Olio'. This place is renowned for its organic olive oil, organic wines, jams, compotes, gelato and more. We will be given a tour of the museum and shown how they make olive oil, and all this is followed by an olive oil tasting and light lunch. The Villa d'Este is a 16th-century villa in Tivoli, near Rome, famous for its terraced hillside Italian Renaissance garden. Tuesday, MAY 5th: As we say goodbye to one villa we say buongiorno to another. Located just outside of Rome, Villa d’Este, is better known as the Tivoli Gardens. This grand, 16th century (formerly) Cardinals’ Villa is home to perhaps Italy’s greatest garden. The garden itself is an UNESCO Heritage Site. Our tour concludes with our driver letting us off at Fiumicino Airport. From there, the next destination is up to you: Are you heading home? Or are you going to head into Rome for a few more days and then take yourself off to the Cinque Terre? Venezia? Or maybe you decide to head south to Napoli, Pompeii or even explore Sicilia? Buon viaggio e grazie mille! Admissions to galleries/museums/gardens/churches which are on our tour itinerary. Total cost of tour is priced based on double occupancy (including all applicable taxes). Every effort will be made to visit the areas, towns, attractions stated in the itinerary, but we are subject to the life and schedule of Italy. Because the excursion is limited to 16 participants, you are encouraged to register as soon as possible. Prices are subject to change based on exchange rates and fuel costs. A deposit is required to reserve space. * our single traveller supplemental fee is on top of the listed price. Itinerary details are subject to change. Price is per person based on double occupancy. There is a single supplement fee for single occupancy travellers. Cancellation Policy: Once full payment has been received, the tour is considered non-refundable. Deposit is required at time of booking. In the event that you must cancel after we have received your deposit, but before you have paid in full - if we are unable to fill your held place in the tour - your Deposit is non-refundable. All participants are required to carry their own travel insurance and trip cancellation insurance.